Antioxidants are found in phenols of extra virgin olive oil. The average polyphenol count measured and reported by the University of California, Davis in 2010 and 2011 was 222 mg caffeic acid/kg oil. While California Super High-Density (SHD) olive oils tested by UC Davis at 41% of average, Berkeley Olive Grove 1913 oils were 159% of average. The primary measure of olive oil stability sometimes cited on olive oil labels is the oxidized oleic fatty acids (free fatty acids). International allowance is 0.8%. California Olive Oil Council is a more stringent 0.5%. Berkeley Olive Grove 1913 offerings have ranged between 0.05% and 0.12%. 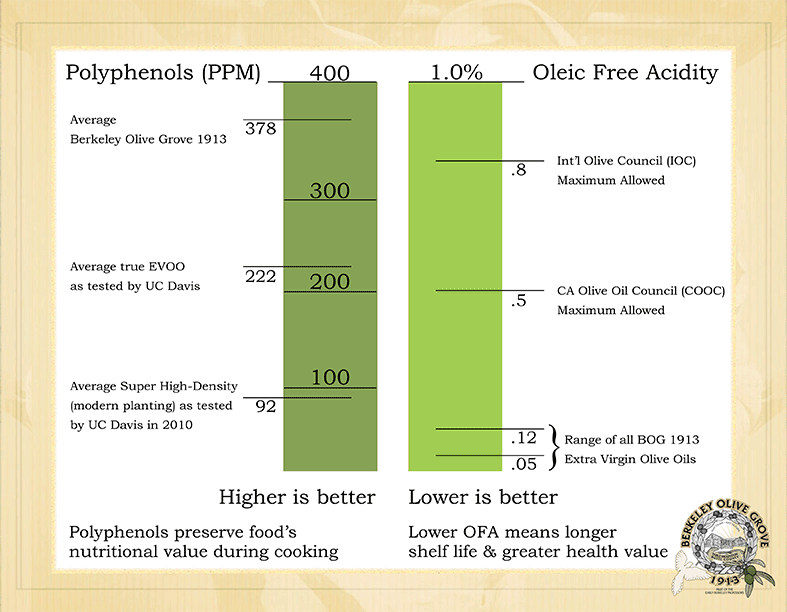 Recent Research Shows One California Extra Virgin Olive Oil Just Might Be Among the World's Healthiest. Jesse Schwartz interviews Darro Grieco of Berkeley Olive Grove 1913. A recent paper published by Dr. Chopra's research group at the Northern Ireland Center for Diet and Health, University of Ulster, had some interesting conclusions. Choosing extra virgin olive oil as your main source of dietary fat, combined with eating a healthy diet that is high in plant foods, may reduce your risk of cardiovascular disease and diabetes. The greatest exponent of monounsaturated fat is olive oil, and it is a prime component of the Mediterranean Diet.